Wondering where to find the most pristine beaches near to your private villa on the island of Bali? 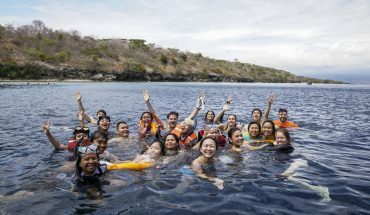 Well, to get the full overview, you can check out our Bali Beach Guide but, if you are curious to know what our personal favourite beaches are, continue reading this article. I asked around the team and this is what they came up with including some secret ones nobody’s head of. These are Villa Finder’s favourite beaches in Bali, and you bet there will be hidden gems revealed! 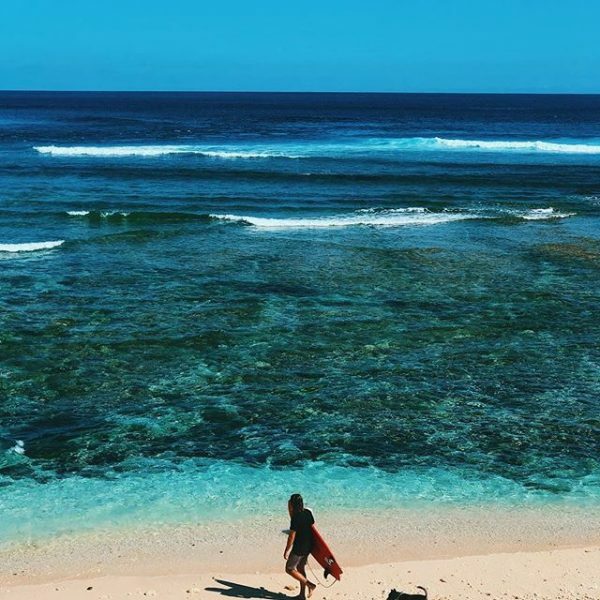 Weni is part of our reservation team and Bias Tugel Beach is her favourite place to go for some good, well-deserved beach time after a hard day’s work. Excellent views, perfect white sands and big waves – just the way she loves it! This gorgeous little bay is hidden away amongst rocks and hills in East Bali – just a short drive away from the harbour of Padang Bai where you can catch the boat to Lombok & the Gili’s. This white sand bay has got the clearest, turquoise waters and the finest sands. There are some local warungs to get your coconuts, Bintangs and nasi goreng and there you have it – the perfect beach day under the sun! (Yes, you got me – this is one of my own favourite beaches, too! 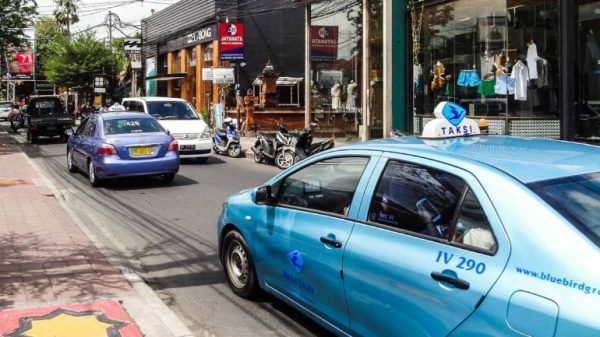 I always go there when I am around that area of Bali but I never knew the name is Bias Tugel). 2. Pantai Geger – Maria, Adrian & Franceska (!!!) say that you must visit it! Geger Beach – one of our favourites. 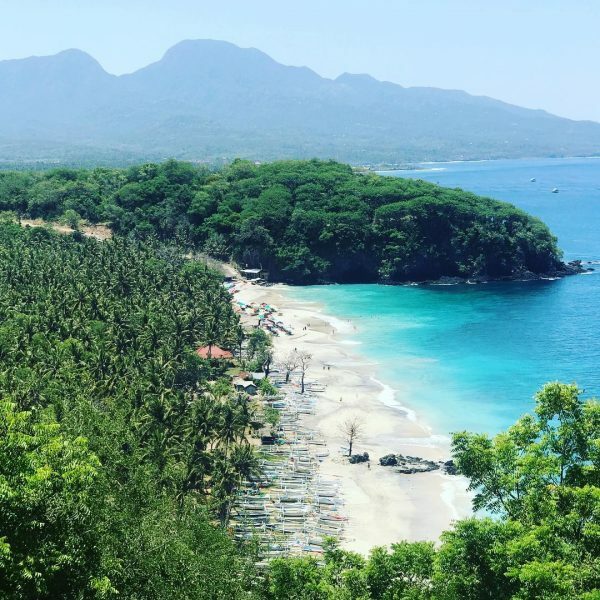 When 3 of our beloved team members tell you to go to Geger Beach – you can be sure it is a must-visit beach in Bali! Adrian, our concierge, says Pantai Geger is good for relaxing, kayaking or paddle boarding. Maria, our head of operations, says this beach is quiet, clean and less touristy and also Fransiska, our concierge manager, says this beach is not too crowded and so you can enjoy it more. 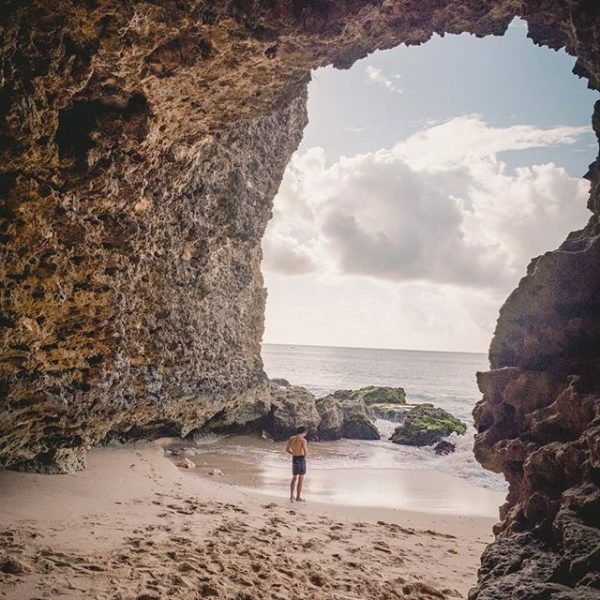 Geger Beach is located in Nusa Dua and it is a stunning public beach in between all of the 5-star resorts. There are plenty of sunbeds and parasols, watersports facilities and affordable local food and drinks. If you go for a little stroll along the shore, you find desolate white sandy bays bordering the stunningly blue Indian Ocean. Time for a cool-down! Diah is one of our expert travel consultants and she whispers quietly to head over to Green Bowl Beach. Clean, quiet, white sands and is good for exercising, too! 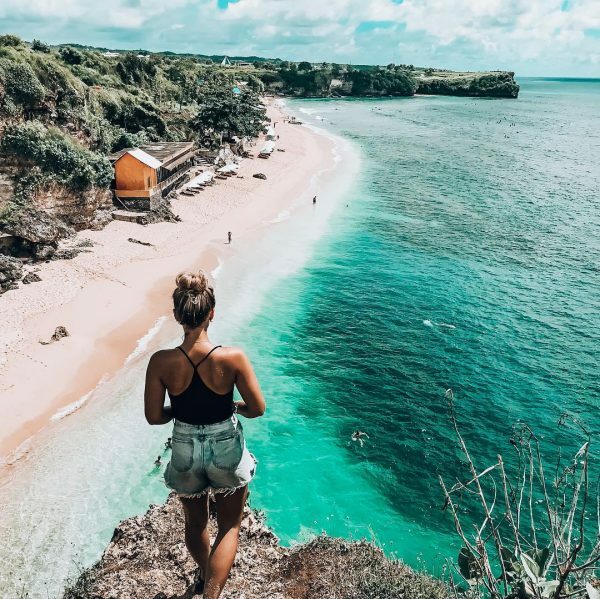 This idyllic stretch of white sand beach is found at the foot of a high 75-meters limestone cliff in Bali’s beloved Bukit Peninsula. Whilst the ocean is perfect for surfing what Diah means with ‘exercise’ is that you need to climb a couple of hundreds of steps up the steep cliff after spending the day down at the beach. This small 30-meter beach is very secluded and very pretty. It is definitely worth your efforts! 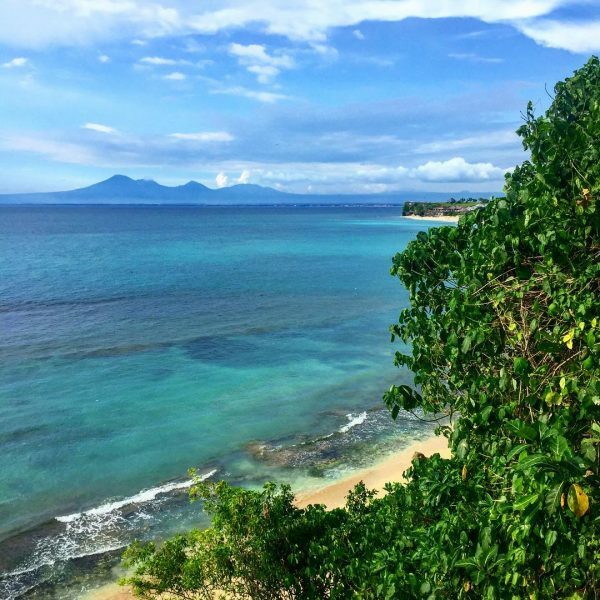 Nindya, part of our marketing team, is also a fan of Green Bowl Beach. If you are a true beach lover, you will appreciate the breathtaking views, she says. Go walk this stairway to paradise and see for yourself! 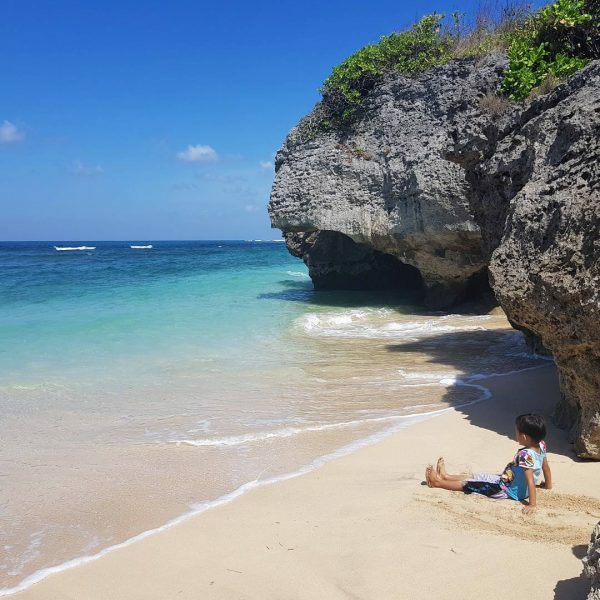 Another secret beach you may want to check our in Bali is Mengening Beach, recommended by Trisna, one of the Villa-Bali travel consultants. Trisna says it is a perfectly dog-friendly beach. 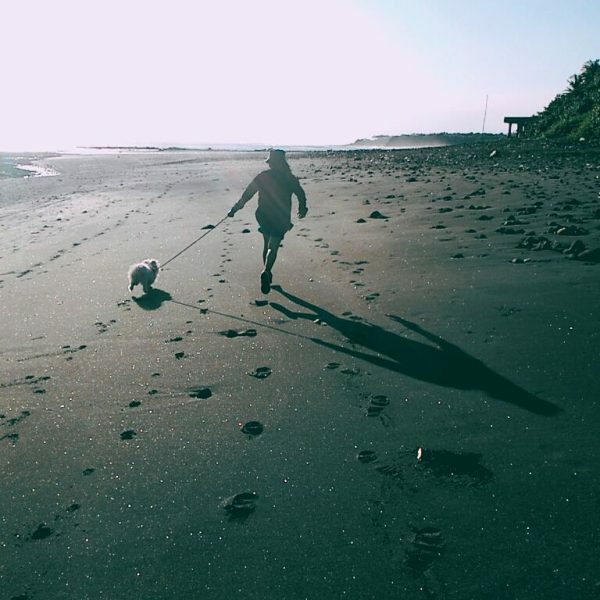 Even his 3-year-old Doberman pinscher admits it 🙂 If you are an expat (to be) living in Bali with dogs and haven’t heard about this beach yet, go check it out and bring your dog friend! Mengening Beach is located in a little village called Cemagi, somewhere in between Canggu and Tanah Lot. A great place to walk the dog (obviously) and do some sunset gazing without hordes of people around. Awesome! You can also see the beautiful Balinese temple Pura Gede Luhur Batungaus, it is located on this beach and great for photo-taking! 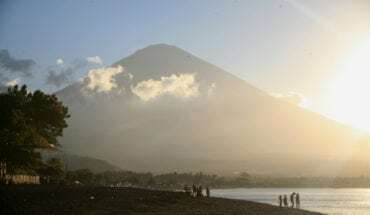 Matahari Terbit Beach is probably the best beach on the entire island to watch Bali’s magical sunrise. Wondering what Matahari Terbit means? Well, it literally translates to ‘sunrise beach‘ so if you are an early bird staying in Sanur, wake up before dawn and start your day magically. Nina loves coming here for sunrise and jogging on the beach. She says it is the best and as one of our greatly valued travel consultants, she should know! Sunrise lovers have to check this one out! Gotta listen to the boss! 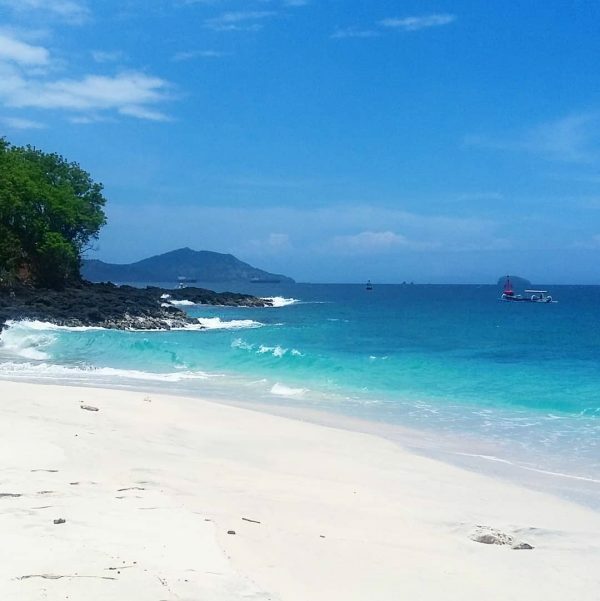 David is founder and CEO of Villa Finder and if he tells you to go check out Bingin Beach, you have no other option but to get yourself down there and check it out. You can thank him later! David warns about the hard access, leading you down a steep staircase but the reward is high: you get to see Bali like it was 20 years ago. 7. 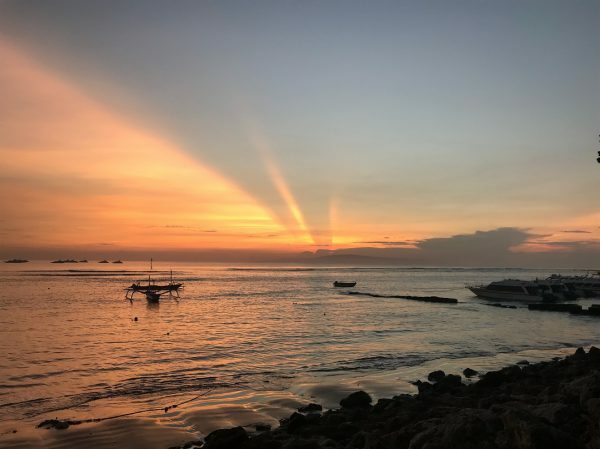 Nusa Dua Beach – Jane loves it! Beautiful! – is all she says! Jane is our finance controller and she fell in love with Nusa Dua Beach. No wonder! This beach features sprawling landscaped parks, intriguing Balinese statues, viewpoints and the clearest water bordering pristine white sandy bays. Families, locals, expats, tourists – Nusa Dua Beach attracts a great mix of beach lovers. There are plenty of peaceful spots, picnic areas, watersport activities and there are great, world-class beach clubs to chill out and sip some cocktails. Reason enough to go check Nusa Dua Beach out! 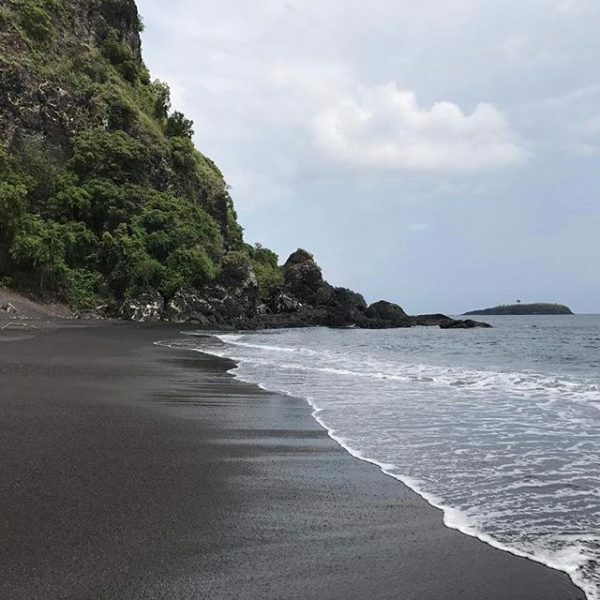 This stunning black sand volcanic beach is completely unheard of until now. Why does Amanda love it so much? Well, at BugBug Beach in Karangasem, you won’t be disturbed by people selling sarongs or anything. On top of that, this beach is huge! Amanda, our head of distribution, tells you to bring your own towel and umbrella and relax the day away. If you wish to escape the crowds and get away from everything touristy, this is your spot! Don’t count on eating stalls or any other modern facilities at BugBug Beach – this is a secret beach and we’d like to keep it that way! Balangan Beach is a surfer’s hot spot and it is also a famous place for pre-wedding photoshoots. Kartika from the marketing department at Villa-Finder.com recommends this beach because it has got easy access compared to other beaches in Bali’s beloved Bukit Peninsula. The beach is not too crowded and during low tide, you can dip into natural pools while gazing at the sunset. Amazing! Lingling from our concierge team says the exact same thing ‘the sunsets are truly awe-inspiring!’. 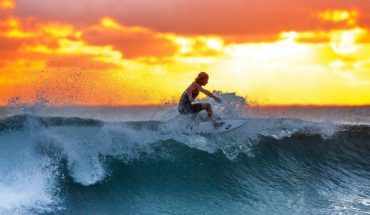 There are some charming beach warungs for drinks and food, plenty of surfers riding those perfect surfing waves and the water is also great for swimming! Balangan is easy to love! Hidden away between rocks and clifftops, you can soak in a natural jacuzzi on Tegal Wangi Beach. Okta is part of Villa-Finder.com concierge team and she says this beach in the south of Bali is quiet and not crowded like Kuta Beach. This beach is located just south of Jimbaran and if you bring a picnic basket and a beach towel, you can spend the entire day here. 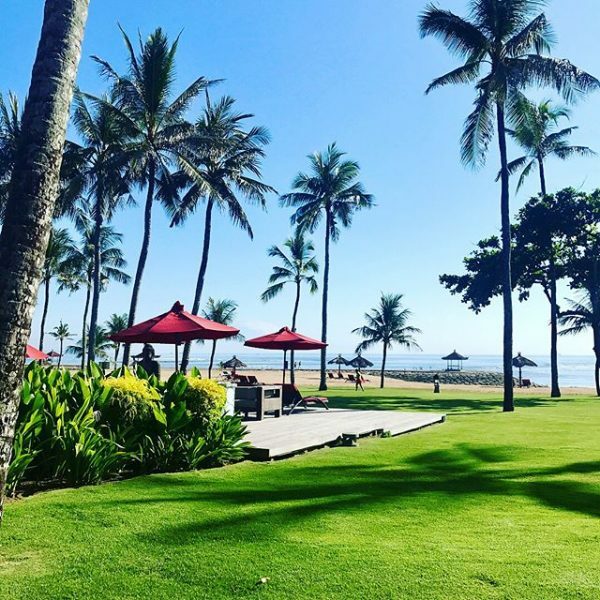 There is shade, there is sun, there are the stunning views to enjoy and there is the clean, blue water, Tegal Wangi Beach is great for families and romantic couples. During low tide, you can enjoy the natural jacuzzi but do be careful. If the waves are a bit wild, better stay safe! Still looking for that perfect villa near the beach? You may want to check out 19 Best Bali Beach Villas.